time is a wonderfully fluid thing – just a moment ago, we were looking at a counter for TDB2015 at 130 days…and today we’re already at 80 to go! 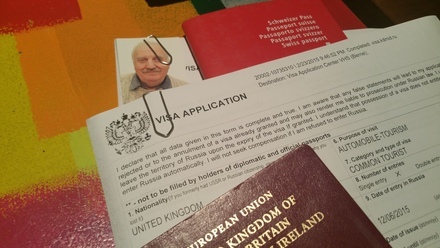 we’re currently applying for our russian visas – nothing has changed here from 20 years ago: you answer a TON of questions, need a “sponsor” from within, every step within the territory has to be accounted for and you need to prove your medical insurance covers russia by providing a written confirmation by your insurer. they were asking for all countries i visited during the last 10 years: an interesting challenge that took me some time…but the results are in > 26! furthermore, i discovered my car insurance does not cover russia – we have been through many a phone call and email conversation on how to obtain some level of insurance (tip: no swiss insurer offers this). given the fact we’re just crossing through russia’s enclave kaliningrad and will be in and out within 72h max, the whole administrative thing seems a tad out of proportion, but hey, we’re here for the challenges, not for the easy stuff! we’re going to be the first TWIKE back to russia after 17 years of absence. 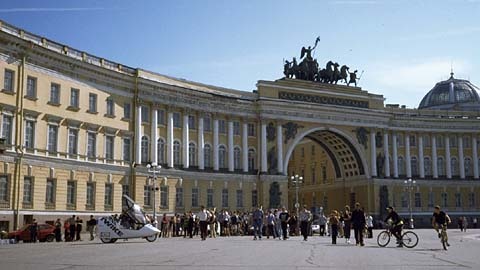 TWIKE’s have already been to Russia in 1998 on their way to the north cape. speaking of challenges – getting TW560 from switzerland to tallin is one of them (if you don’t want to spend CHF 10k). Taxes and export regulations aside, no car logistics company seems interested in handling a TWIKE. since the vehicle is small, we could send it as normal cargo but everyone i spoke to discouraged me to do so, since there would be no guarantee of it not being damaged during transit. all logistics companies i spoke to recommended we first place the vehicle in a custom-built transport box (CHF 1+k), then ship it. to top things off, everyone told us to ship TW560 from germany – not switzerland – to save on export/import taxes and spend less time sorting out taxes on the way back. yes, we’re considering other options – ideally, we’d have someone from estonia come to get TW560 with a small transporter and drive it up to tallin. since car dealers of this size usually don’t advertise such transport options, because they usually travel to central europe with an empty truck and drive back with the used cars they bought here. know anybody fitting this description? please let us know. interestingly enough, i will be flying to tallin from rome, since i will be in italy from beginning of june, 2015 onwards. june 10, after more than one week in italy (really looking forward to it!) the differences between italy and estonia will be an interesting feature of the trip.